Any brochure or document about Peru always displays the iconic image of Machu Picchu, the ancient Incan citadel. Quite rightly too, as the Unesco World Heritage Site should be top of any visitor’s itinerary to South America. Discovered by chance in 1911 by American archaeologist Hiram Bingham, the ancient citadel is surrounded by karst lime-stone mountains covered in lush jungle. The citadel is perched on a peak and is accessed either by foot, via the Inca Trail, or by bus and train from Cusco. Despite the popularity of the ancient site – around 2,500 people visit each day – Machu Picchu still retains a mystical allure. This is in part due to the magnificent location and in part due to the fact that the raison d’etre of Machu Picchu is still unknown. Historians and archaeologists have published many theories about the purpose of the ruins – from ancient Inca school, to sacred temple, to secret hide out. Each guide at the site has their own theory, but it is down to each individual visitor to devise their own conclusions about the place. Despite the number of visitors, there is always a chance to find a quiet spot to sit in contemplation of the grandeur and scale of the site and marvel at the strength and resilience of the Incan builders who were involved in its construction. A day is probably enough time to spend exploring the site. Early risers might want to start with a trek to Inti Punto, the Sun Gate in time for the sunrise. This is where the Inca Trail reaches Machu Picchu and is said to be the sacred entrance to the site. Quite often the view from here is misty first thing in the morning but as the sun starts to burn through the cloud and the first sight of the citadel becomes visible, it is a magical feeling. From here, it is a down-hill walk to the ruins and the iconic view. After exploring the main site, it is worth taking a 20 minute hike to the ancient Incan Bridge, which demonstrates the feat of engineering. A climb of Waynu Picchu, the mountain at the ancient site, is possible, although you will need to purchase a permit as the number of visitors is strictly limited. Permits for this need to be purchased in advance. 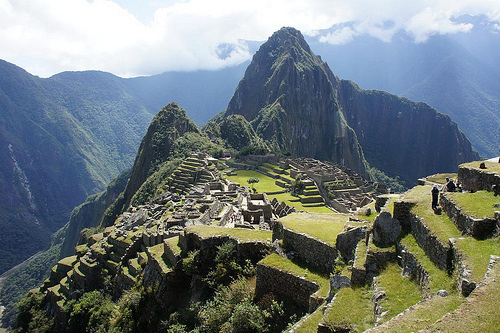 The best way to visit Machu Picchu is to combine it with a stay in Cusco. An interesting blend of Spanish and Quetchan heritage, this ancient Incan capital city is well worth a day or two spent exploring. It is a vibrant and buzzing town, which never fails to capture visitors’ hearts. The Sacred Valley, an hour outside of Cusco is home to several examples of Incan ruins and terraces and a visit here helps to further understand the ways and workings of the Incan cultures and practices. It also is home to the sacred Urubamba river, which offers some fantastic white water rafting.